The area of the North Shore of Lake Minnetonka began to be settled in the late nineteenth century and by 1915 Wayzata was a thriving community. Before Saint Bartholomew was established, getting to church was difficult for many people in the area. During the summer, many took the boat across the lake and then went by streetcar to a church in Hopkins or possibly in Excelsior. Or others went by horse and buggy to Holy Name. Many "old-timers" recall walking to Holy Name on Saturday to receive instructions in the catechism and the family would walk over again to Holy Name on Sunday morning for Mass. Weather conditions in the winter often made it impossible to get to church for weeks at a time. With the support of the Rev. George Bartholomew Scheffold, OSB, they approached the Archbishop with their plan. The Archbishop contacted the Abbot at St. John's in Collegeville and requested the Benedictines staff the new church. On Oct. 8, 1916, the cornerstone for the small, white stucco church seating 60 people was laid at Highway 12 and Broadway. On Christmas Day of that year, the first Mass in the new church was celebrated, with Father Scheffold presiding. Several months later, the church was named St. Bartholomew, in honor of its founding pastor. The people of the parish, continued their efforts to raise funds to carry on the work of the parish. Ice cream socials were frequently given in the Wise Pavilion. Bazaars, church dinners, card parties and festivals all helped to provide for the parish as well as help retire the initial $500 debt for the new church. By October of 1921, exactly five years after the laying of the cornerstone, the church debt was paid in full, and Mr. Richard Gibbs who signed the first note had the pleasure along with the other parishioners, of seeing the first mortgage burned. As the community grew, parishioners and pastors responded to the needs of the times. By 1941 a new rectory was built and in 1955 a convent and school. The first students to enter St. Bartholomew School did so in the fall of 1956. The school was staffed by the School Sisters of Notre Dame came to staff the school who helped enrich the community through their devotion to quality education and sacramental preparation. 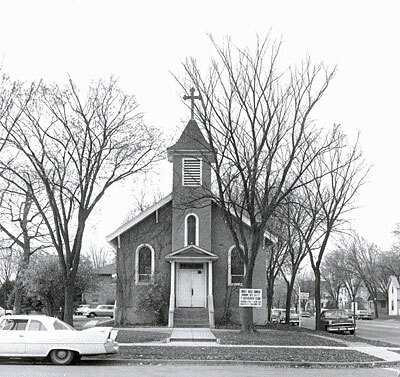 As suburban neighborhoods developed, St. Bartholomew experienced an increase in parishioners. With the completion of a feasibility study and input from the Archbishop, a new church which could accommodate 840 parishioners was erected in 1961. Then in 1989, due to the completed needs assessment, the church and school buildings were tied together by the addition of an expanded narthex and fellowship hall. The debt from this project was paid off by January 1997. That's not to say that St. Bartholomew stopped growing. In 1998, the lower level of the church was finished, adding nine new meeting rooms. Staff was added in the areas of volunteer and youth ministry, communications and technology. In September 2007, after six years of discernment and planning, designing, and construction we completed an expansive renovation of both the church and the school, preparing the way for our thriving community for the next 100 years. Our new church is at the heart of a complex of buildings that has been entirely renewed. The school is today more attractive and better-equipped than it has ever been in its 60+ year history, and the new meeting and gathering spaces help better fulfill the varied mission that Christ entrusted to his church: to worship, to teach, and to serve. Now as we look with gratitude to our ancestors in faith, we realize that what we have in our parish today is the culmination of many people's efforts. The spirit of generosity of the early families that founded this parish is very much alive today. We are grateful to God for the gift of this parish community and pray that our parish vision and mission continue to be realized now and in the future through our efforts and the guidance of the Holy Spirit.